If early summer comes, it is a beehive small to under the eaves of a house, or a garden tree. A beehive becomes large rapidly soon. 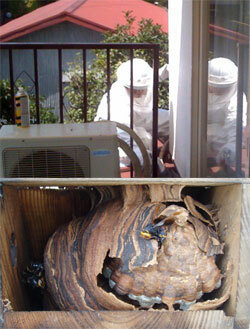 When a beehive is small, it can exterminate comparatively easily. However, if a beehive becomes large, the number of bees will also increase, and extermination will become difficult if it is not a special contractor. Danger is accompanied by nest extermination of a bee. Especially the work of a height is dangerous. Please request nest extermination of a bee from us. A charge changes according to those conditions(The number of bees. The size of a nest. Nest building place. Height. Difficult part work. etc.). The above-mentioned expenses are transportation expenses and a charge including tax.